Favorite. Bronzer. Ever. I believe I feel like a sun god or goddess when I wear this! I'm all about that natural, flattering summer glow this gives me. There's a reason tans never go out of style... there's just something about that healthy glow! - A little goes a long way... very pigmented! So blend, blend, blend! - Long-wearing. Stays on all day! - Long-lasting product... so much powder included, I've yet to run out, and I've had it over a year! I keep a backup just in case. 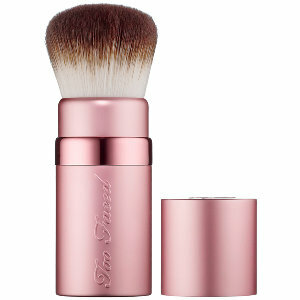 I recommend using this with the Kabuki Brush by Too Faced. It's super, super soft, and blends out powders perfectly. Well worth the money. Hoola Bronzer comes highly, HIGHLY recommended. Well worth the price for the quality AND the quantity included. I'm all about that glow, bout that glow, no orange! What's YOUR favorite bronzer? Let me know in the comments below!